Clay Jannon has moved from the world of computers and technology into the musty shelves of Mr. Penumbra’s 24 Hour Bookstore. Clay was recently laid off, from his job of website development for a bagel shop.The shop was ran by a married couple, that was recently retired from working for Google. He has been cruising the streets of California for a long while now, looking for a new job. Eventually, he stumbles across the “Help Wanted!” sign on Mr. Penumbra’s 24 Hour Bookstore. After he is hired, for the night shift, he learns how to scale ladders and keep a log on all of the customers that happen by. The customers are few and far between, never checking books out, but “borrowing” them for extended periods of time. He then, tempted by one of his friends, breaks the most important rule “don’t touch the books” and finds out more than he was suspecting. When he brings his findings to Mr.Penumbra’s attention, he finds that the bookstore has many more secrets than Clay had ever suspected. 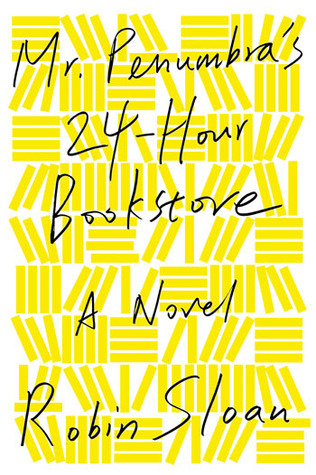 Mr. Penumbra’s 24 Hour Bookstore by Robin Sloan was a enrapturing book that held my attention the whole way through. Clay and his friends (all who have experience with computers) crack many codes along the way and discover some shocking secrets, while managing to anger the leader of a strange cult. This book is cleverly written, with quirky characters. At first, I thought I wouldn’t enjoy this book because the first few chapters were just explaining Clay’s past and his current lifestyle. But, as the book went on, new characters were introduced and a mystery/ adventure was unfolding.I enjoyed the book, but some of the vocabulary was hard to understand, making the book confusing at times. I would suggest this book to people who understand technical devices because of the terminology used when talking about computers. This book taught me that while a wild, computer hacking adventure is fun in all, that sometimes secrets are hiding in plain sight.